A new street level event space in the center of the historic West Chelsea Highline Arts District. 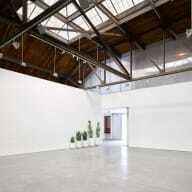 Located in the former prestigious Andrea Rosen Art Gallery Space. A spectacular space with unique architectural details including 24 foot ceilings, exposed steel beams and a magnificent central skylight. Combining the flexibility of a white box space with the warmth of an authentic, historic details, it is a an inspiring space for events such as product launches, fashion presentations, cocktails and marketing experiences. The space boasts a full catering kitchen, coat-check area, breakout-rooms and Wi-Fi. Price may vary depending on the number of people, date and days of the event. HOLIDAY SEASON PROMO PRICES. All space usage rates currently posted on Splacer are estimates applicable only for events activated to take place in DECEMBER 2018 (excluding NYE) In addition to the space usage rate, a service fee of $1,500 per day applies to all events activated in the space in December 2018 (excluding NYE). Service Fees DO NOT cover: Cleaning which is additional Security which is is additional Fireguard which is additional The final price quote for any other month/year will depend on the actual date, time, guest count, number of days and season.